[A brief preface to today's article: Novus Ordo Watch Wire starts its Tradcast Podcast on Monday, January 19, 2015, the Feast of Saint Marius and Companions and the Commemoration of Saint Canute. Please make sure to listen as the Novus Ordo Watch Wire site is the best source for instant news, accompanied most of the time by consise, compelling commenataries, on the internet today. Indeed, there are only two other sites, The Daily Catholic and Call Me Jorge that I believe provide superb information without distorting facts. 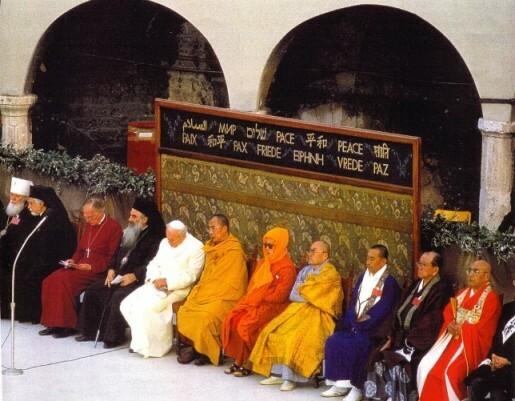 Each of these three sites is noted for linking to original articles so that readers can see that nothing of what the conciliar revolutionaries have said and done has been taken out of context or presented in an intellectually dishonest manner. 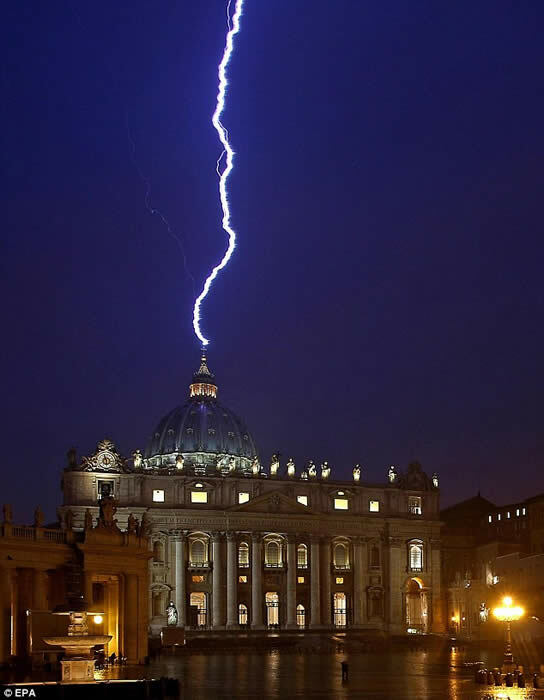 Catastrophe seems to strike wherever Jorge Mario Bergoglio finds himself in the world. One of Vatican Radio's correspondents, Sean Patrick Lovett, wrote a report about the conciliar "archbishop" of Rio di Janiero's liturgical travesty on Tuesday evening, July 23, 2013, the Feast of Saint Apollinaris and the Commemoration of Saint Liborius, that gushed with awe-filled wonder at what unfolded during the carefully staged and choreographed outdoor revival ceremony that called itself a "Mass." That report was referenced in yesterday's commentary on this site, Francis The Syncretist. 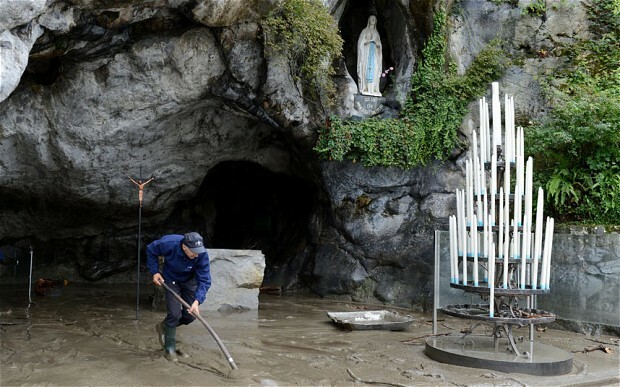 (Vatican Radio) So the rain finally had its way. It even succeeded in changing the best-laid plans of Popes and men. 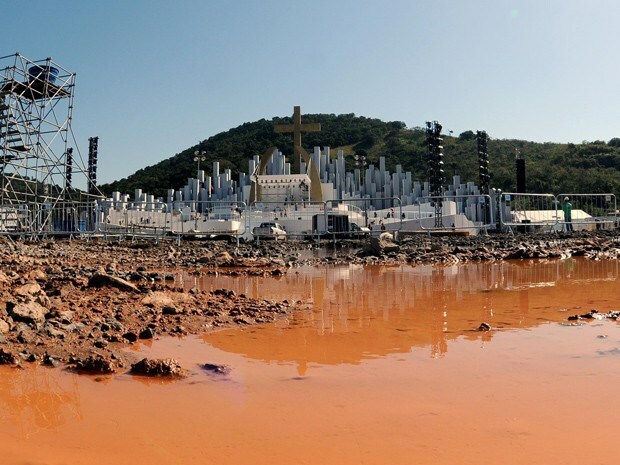 The Campus Fidei at Guaratiba, originally scheduled to host both the Youth Vigil and the closing Youth Day Mass, is now officially out of bounds. 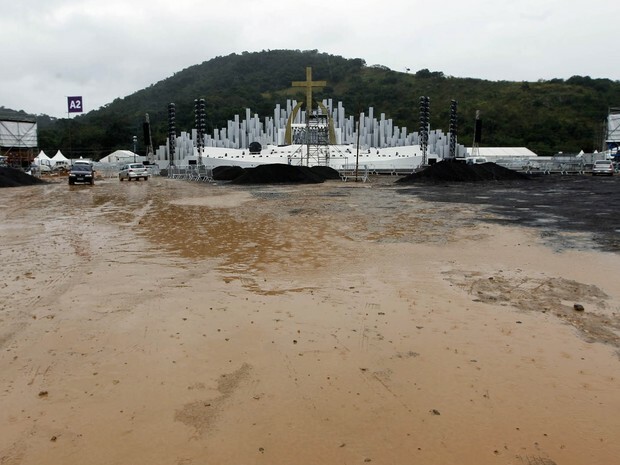 What until last week was a bucolic, grass-covered, tree-lined park worthy of welcoming any pope, currently looks more like a Florida swamp. Mud and sludge alternates with improvised lakes and marshes – the result of days and nights of incessant rainfall. Well, there is only one. 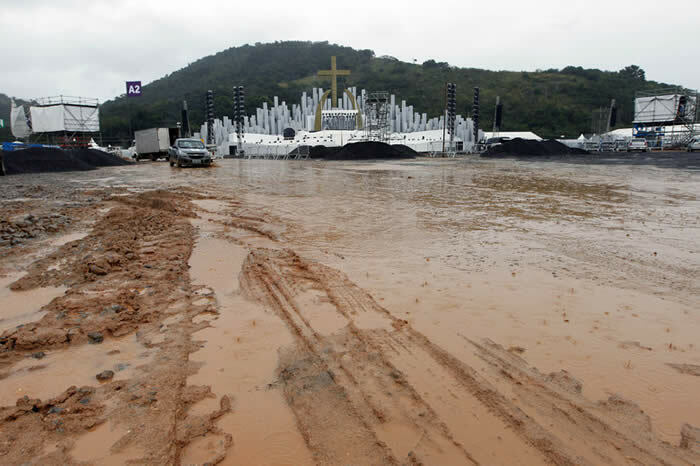 At such short notice, the only alternative is to concentrate everything at Copacabana: the stage is already there, the sound and illumination systems are in place, the facilities and utilities were already tried and tested during the opening youth day Mass on Tuesday. No, God will not mocked. 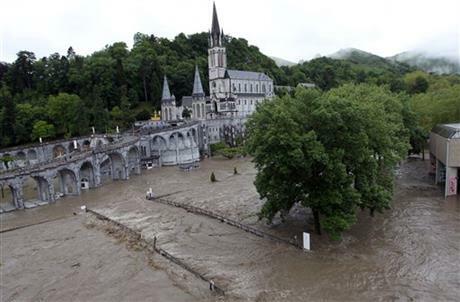 Remember also that flooding devastated the Shrine of Our Lady of Lourdes twice in the past year. God will not be mocked. He continues to send clear signs of His displeasure by means of natural disasters of various sorts, and it is indeed very possible that He is showing his displeasure with the lords of conciliarism and their numerous falsehoods by permitting various events to occur in close proximity to developments in the conciliar church. A group of children were reported to be in attendance at the time. The two popes will be declared saints at the Vatican on Sunday. It is not the first death caused by a falling crucifix in Italy. The massive cross was unusually shaped – it bowed and bent downwards and was held in place by steel cables. Wherever Francis goes, there is mayhem, always theologically and spiritually, sometimes even physically. We call him “Chaos Frank” for a reason. It’s pretty evident that Almighty God is making it extremely easy now to “get it.” Ever since Jorge Bergoglio’s election on March 13, 2013, the Vatican II Church has been in utter turmoil. SEOUL, Aug. 28 (Yonhap) -- President Park Geun-hye said Thursday that she would consider declaring South Korea's southeastern areas hit hard by recent torrential rains a special disaster zone. The designation, if made, would make the affected areas eligible for additional government support, including up to 80 percent of the costs associated with the disaster. "I will consider declaring a special disaster zone" after assessing damage caused by torrential rains that hit the country's second-largest city of Busan and nearby areas on Monday, she said. She made the comments as she toured areas hit by torrential rains that sparked landslides, disrupted rail services and temporarily halted the operation of a nuclear power plant. Heavy downpours also left 13 people dead and one missing, according to the National Emergency Management Agency. One of the hardest hit areas is Gijang, a county in Busan, which received a record 160 millimeters (6.2 inches) of rain per hour on Monday. Also Thursday, the government and Park's ruling Saenuri Party held a meeting and reached a consensus on declaring a special disaster zone, according to Cho Won-jin, a ruling party lawmaker who attended the session. Park instructed officials to provide every possible support to those who suffered losses due to heavy rains, and to come up with fundamental anti-disaster measures to ensure similar damage does not recur, according to her office. Tragedy struck Pope Francis' visit to the central Philippine city of Tacloban, where he was comforting victims of Typhoon Haiyan, a devastating storm that left more than 7,300 people dead or missing just over a year ago. Police said a 27-year-old volunteer with Catholic Relief Services who was among about 150,000 people who attended a rain-drenched Mass celebrated by the pope near Tacloban's seaside airport was killed after she was hit by scaffolding. Vatican spokesman the Rev. Federico Lombardi said the pope inquired about how he could show "his own suffering and solidarity" with the woman's family. Police reports said the woman, who suffered a skull fracture, was an only child. While we must pray for those who have suffered and the souls of those who have died as a result of catrastrophes associated with the near-presence of a known apostate and blaspheme are merely symbolic of the devastation wrought in the vineyard of Christ the King during this time of apostasy and betrayal as a result of the dawning of the age of conciliarism with the "election" of Angelo Roncalli on October 28, 1958, the Feast of Saints Simon and Jude, as the first in the current series of papal usurpers. Giovanni Battista Enrico Antonio Maria Montini/Paul the Sick is certainly not able to “bless” anyone form the “heavens.” This doctrinally, liturgically, pastorally and morally corrupt socialist and Judaizing force in the counterfeit church of conciliarism presided over three full sessions of the “Second” Vatican Council before he took the wrecking ball to almost everything to do with Catholic life as it had been known from time immemorial until then, starting with the Sacred Liturgy itself. This hideous, venal little man, who was blackmailed by Soviet agents into betraying the identities of priests sent behind the Iron Curtain by Pope Pius XII had sent them there when he, Montini, was working in the Secretariat of State of the Holy See, ruined the good order of prayer life and conduct within the communities and men and women religious. He instituted a regime of novelty as something to be expected as “natural” in the life of what he represented as the Catholic Church. He sold out great foes of Communism such as Josef Cardinal Mindszenty, the Primate of Hungary, while giving the Communists almost everything they wanted from him as part of his rotten policy of Ostpolitik. Giovanni Battista Enrico Antonio Maria/Paul the Sick appointed homosexual men to the conciliar hierarchy, whose very validity he overthrew when promulgating the conciliar rite of episcopal consecration in 1968. Giovanni Battista Enrico Antonio Maria/Paul the Sick “blesses us from the heavens”? Well, what does one expect from a man, Jorge Mario Bergoglio, who cut his revolutionary eye-teeth and began his presbyteral career while Montini was masquerading as “Pope Paul VI”? The nymphomaniac, racist and eugenicist named Margaret Sanger, the founder of the Birth Control League that became known as Planned Parenthood, that's who. Her followers continue to champion this shopworn slogan that found its way into the text of an alleged "papal" encyclical letter. Montini/Paul VI's acceptance of "responsible parenthood" slogan of Margaret Sanger and her diabolical minions, coupled with the inversion of the ends of marriage propagated by Dietrich von Hildebrand, constitutes a revolution against the ends of marriage that have "baptized," if you will, a supposedly "natural" form of contraception that is to be used as a matter of routine, not in truly extraordinary cases, where is it only lawful, that is, permissible, and never mandated. The conciliar revolutionaries like to throw a few crumbs now and again in the direction of the “Pelagians” within their ranks so as to keep them as happy on their conciliar reservation just as careerist Republicans throw a few crumbs now and again in the direction of “pro-life” and “pro-family” conservatives to keep them on their own reservation of naturalism. The crumbs thrown by Jorge Mario Bergoglio in Manila two days ago, though, are laced with the poisons of Giovanni Battista Enrico Antonio Maria/Paul the Sick’s revolutionary endorsement of “natural family planning” and Karol Josef Wojtyla/John Paul II’s truly demented “theology of the body” that arose therefrom in perfectly conformity he the personalism that had been condemned by Pope Pius XII in 1944 and 1951. This describes each of the spiritual robber barons who have posed as “popes” since death of Pope Pius IX on October 9, 1958, including the two living “popes,” Joseph Alois Ratzinger/Benedict XVI and Jorge Mario Bergoglio/Francis. Yes, The Chair is Still Empty, which is why we need to pray today, which is the commemorated Feast of the Chair of Saint Peter, for the restoration of a true pope on the Throne of Saint Peter, something that will occur in a truly miraculous manner. Let us continue to trust in Our Lady and her Fatima Message in these troubling times as we run whatever risks we must to avoid all contact with conciliarism and its fraudulent officials in order to cleave to Catholicism without any reservations or qualifications whatsoever.